Experience softer, younger-looking skin from first use. This booster contains a concentrated blend of hyaluronic acid and skin-repairing ingredients like ceramides to immediately hydrate skin and lock in moisture. From the very first use, the liquid-gel texture leaves skin visibly softer, smoother and younger-looking. If i could only buy one skincare product forever then it'd be hyaluronic acid. It's the type of product you think does nothing but when you stop using it your face and skin looks less plump and young. I like using this product on its own after an exfoliant and then pile on serum and moisturiser, it feels like it has the best effect that way and can penetrate deeper into my skin. It is thin, like a liquid gel and sinks quickly into the the skin, if you use too much then it might feel a bit sticky, but I don't mind since I use it at night. The dropper works fine, I use it to drop directly on my face to not waste product. And when I run out I always notice a difference in my skin - less plump and hydrated, so I'm buying it again. I tried a sample of this booster. It is very different than a Renewal Oil Booster. This is thicker. 1 to 2 drops mixed with your serum or moisturizer is enough. I use oil whenever my oily skin feels dehydrated or flaky. Maybe I will buy one of these boosters - after I have finished my other Treatment Oil (try that, sorry Paula). I tried a sample, used it around the eyes were my skin is a little dry and I have fine lines. I didn't see any diffirence. I only used a drop each time, it was enough to spread all around the eye area. The application is great, it spreads easily and it absorbs immediately, as if it's plain water. But it felt like it didn't moisturize my skin at all and I noticed no visible diffirence either. Customer Care: Thank you for your review. We are sorry to hear that this product has not worked for you. In this case, you are welcome to contact our customer care department for further assistance. I'm on my second bottle of this excellent product. It really moisturizes. Unfortunately both times the dripper do not work- I have to pour from the bottle - so I get way too much product in my hands every time - and then it gets really expensive. Customer Care: Thank you for your feedback. We are sorry to hear that dropper is not working properly. It may help to first pinch the dropper top before you put into the bottle and once it's in, leave the top and give it a few seconds to absorb the product. Take the dropper out of the bottle and see if this helps. Otherwise, please contact our customer care team for further assistance. 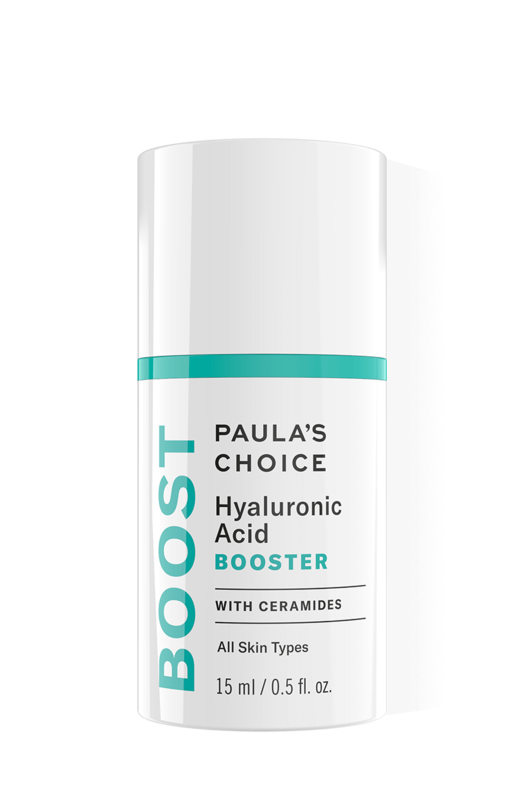 Do I apply Hyaluronic Acid Booster all over or just as a spot treatment? Either application method is fine; choose based on where your skin needs a bit of extra help, such as around the eyes or deeper lines on the face—or anywhere you want more moisture without a heavy or slick feel. Is Hyaluronic Acid Booster suitable for rosacea-prone skin? Yes! In fact, it is highly likely to improve symptoms of rosacea-prone skin such as redness and sensitivity. That’s because this blend of oils is chockfull of antioxidant, anti-inflammatory, and barrier-repairing substances that can strengthen skin’s surface and its ability to withstand damage. Can I use this booster around the eyes? Hyaluronic Acid Booster can be perfectly blended with our Resist Anti-Aging Eye Cream. Add one or two drops to the eye cream and apply. Or you can first use the Hyaluronic Acid Booster and apply over that the eye cream.